Google Docs is a rich online word processing and spreadsheet editor. Besides online editing, you can upload large files of almost any format to your Google Docs account. 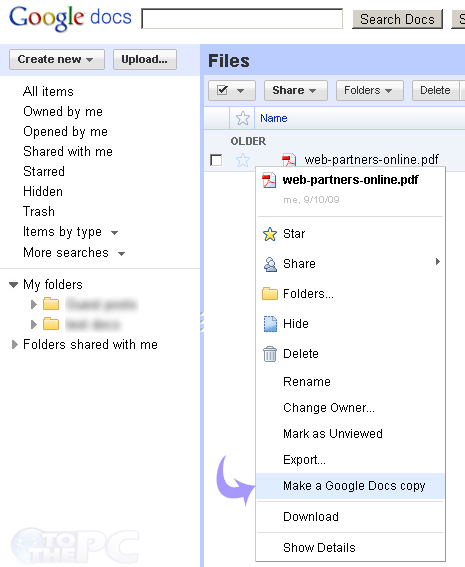 Newer features of Google Docs like collaboration require files in Google Docs format. Hence, you need convert your uploaded files into Google Docs format to work with them using new Google Docs features. 1. Goto docs.google.com to access your Google Docs. 2. Upload new file by click ‘upload’ button or proceed to convert existing uploaded file. 3. Right click on the file in the document list and then click on “Make Google Docs copy” option.